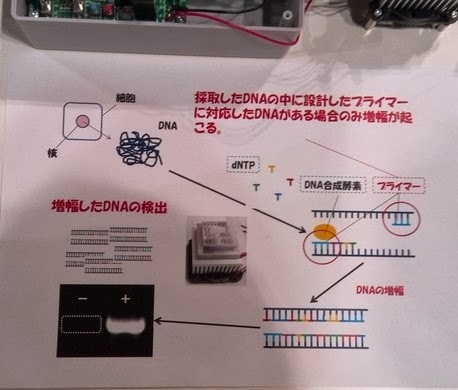 DNA amplifier: this is a device commonly used in Biotechnology laboratories for amplifying segments of DNA via the polymerase chain reaction (PCR). 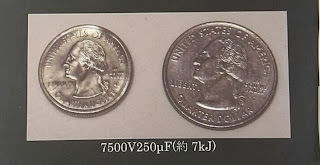 Also known as thermal cyclers, these devices are usually very expensive (more than 800,000 yen). However, thanks to their Open Thermocycler Implementation you may be able to build it for less than 30,000 yen. 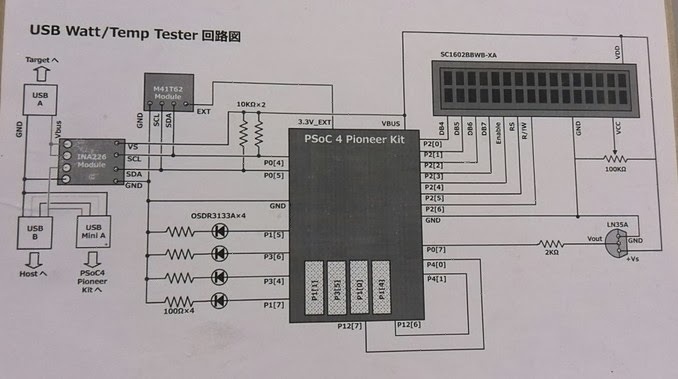 They were using a pile of peltier devices for cooling. The only problem is that you also need some materials that are very hard to buy if you don't belong to some institution. 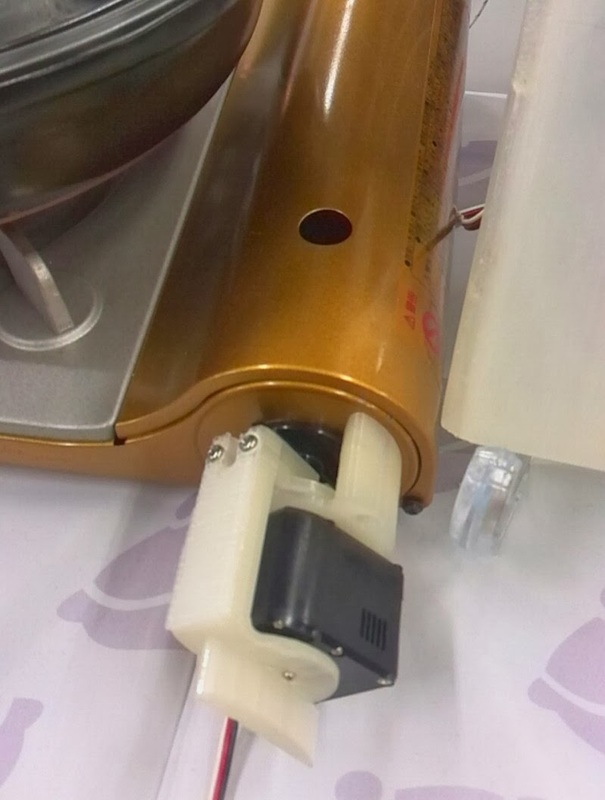 Music with solenoids: an interesting idea that uses solenoids for making drum beat patterns on dishware. A smartphone application is used for creating the patterns. Moving magnets: an interesting phenomena in which a set of magnetic rings go up and down a metal stick due to a rotating magnetic field. The rotating magnetic field was created by removing the rotor from an induction motor. This device was invented by 佐藤慶次郎. Bass reflex loudspeakers (バスレフ型): a guy who was designing his own loudspeakers. 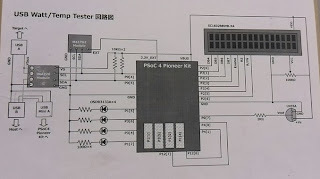 The design is based on a formulas and there are several types. He measured the frequency response by producing white noise with a computer, and then measuring the resulting sound with a normal microphone. Loudspeakers usually have separate speakers for the low and high frequencies, so a filter step is necessary. Since the required power is high, the coils, capacitors and cement resistors were quite big. DIY Motor: this was a motor fueled with a mix of alcohol and some other substance. It also had an electric motor that served as the starter. 3D printers: there were lots of 3D printers in Maker Faire. 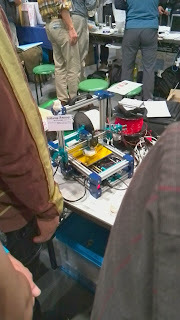 The ones I saw were mainly one of two types: 3-axis CNC-like 3D printers; and another type base on 3 columns. 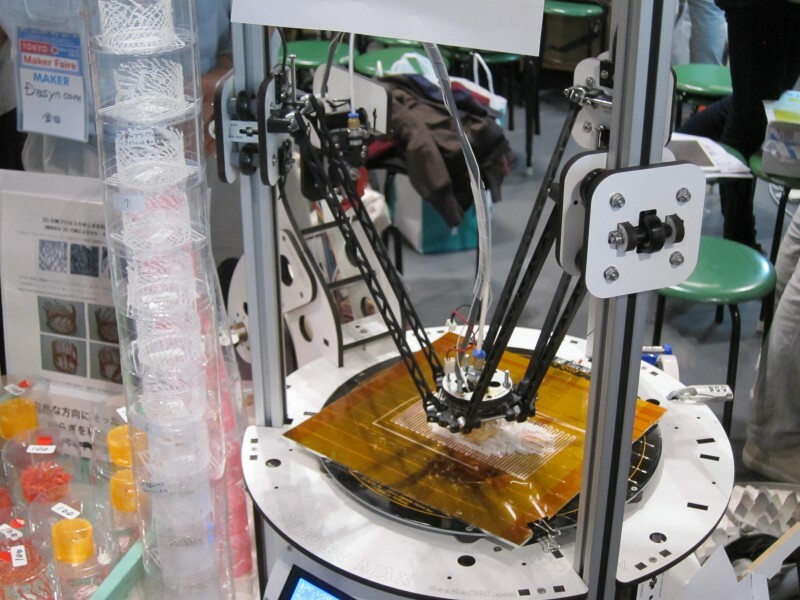 The CNC-like 3D printer above is an implementation of the FoldaRap open hardware, whose main feature is that of being portable. 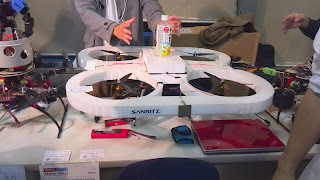 Quadcopters drones: there were several booths with quadcopters. 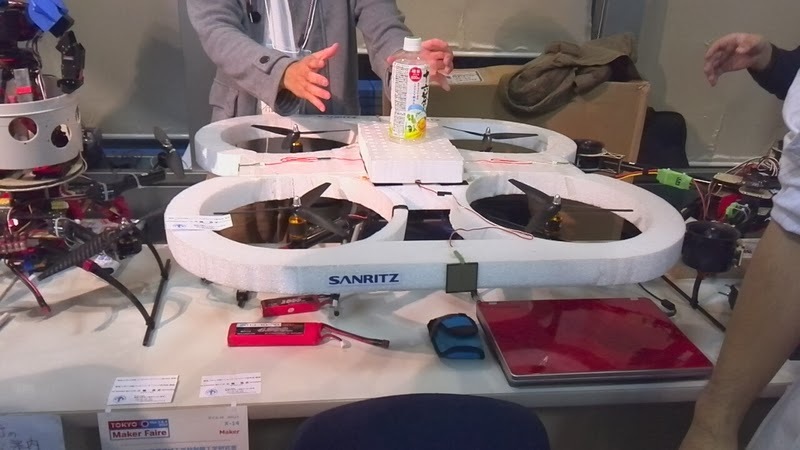 I especially liked the small quadcopter above. It was designed by @banboohill (twitter) who is planning to sell the board at some point in the future. 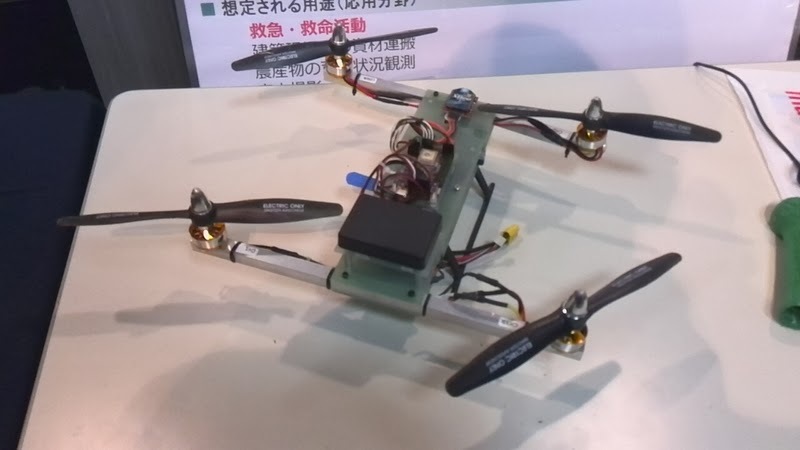 It seems that he had a hard time due to the noise caused by the circuits powering the motors onto the digital part. The other big booth was from Tokushima University. 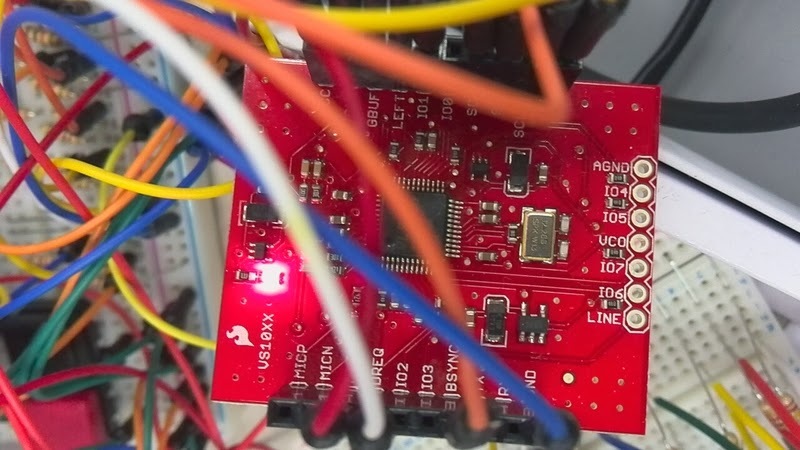 A GUI programming tool for Arduino: the authors (@takuo_o) created a GUI tool by which you can create filters, integrators or logical bifurcations on a browser, and then transfer the result to an Arduino board. 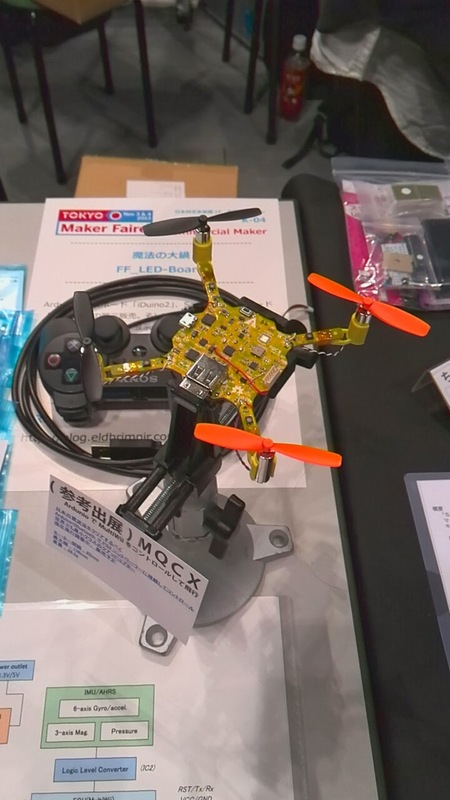 They were using a board that included a capacitance-based touch sensor. 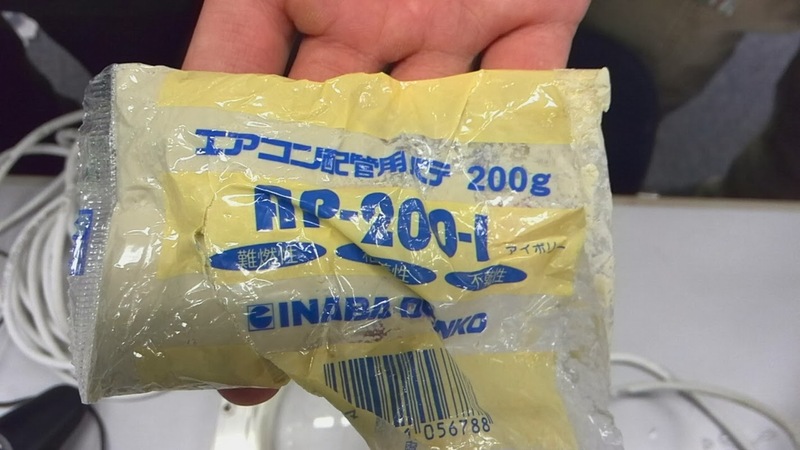 Airplanes made of plastic bags: some of them were made without motors. 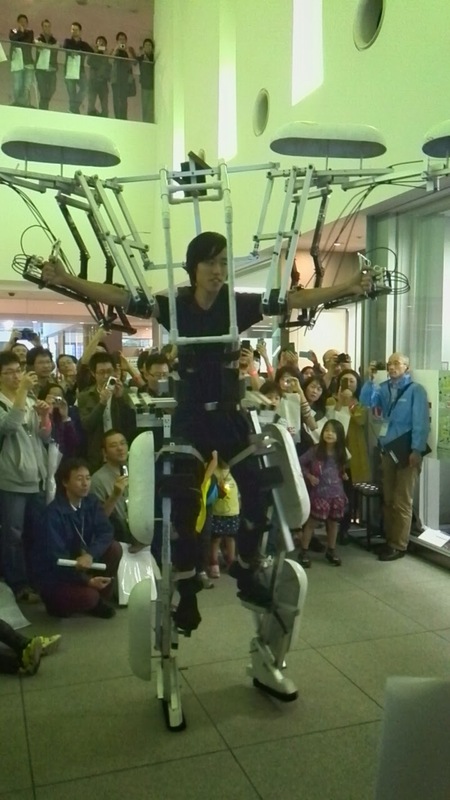 The armature was made with a 3D printer. Those which do use motors were made with circuitry from Hitec multiplex. 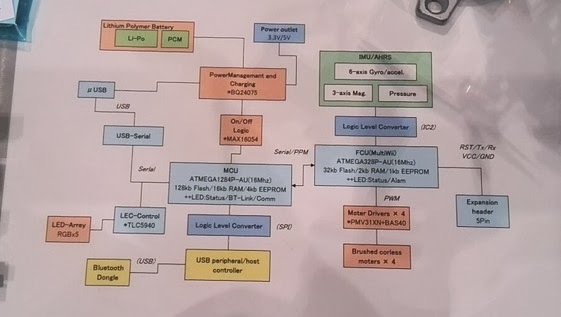 Power consumption and temperature sensing: this guy was trying to measure the power consumption and temperature of a tablet device through the USB port. He was using an INA226, which as an internal shunt resistor for measuring power and exports and easy-to-use I2C interface. For sensing the temperature he was using an LM35 temperature sensor. Magnetic levitation: I was specially interested in this project since I had been planning on creating a similar one. The idea is to control the magnetic field running through the coil by using the feedback from a hall-effect sensor placed just below the coil. They were using an A1324LUA-T which you can buy at 秋月電子. By the way, the bluish components on the board are not resistors but coils. 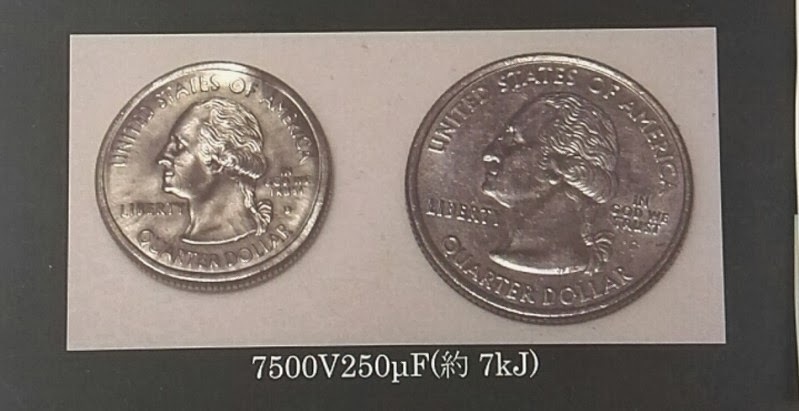 Coin shrinking: applying a high voltage (7500V) to a coil causes an instantaneous huge magnetic field that while destroying the coil itself with a strong sound, it also happens to shrink a coin that was placed on top of the coil. Timelapse movies: by using an Infrared LED it is possible to remotely control a camera for taking periodic shots. 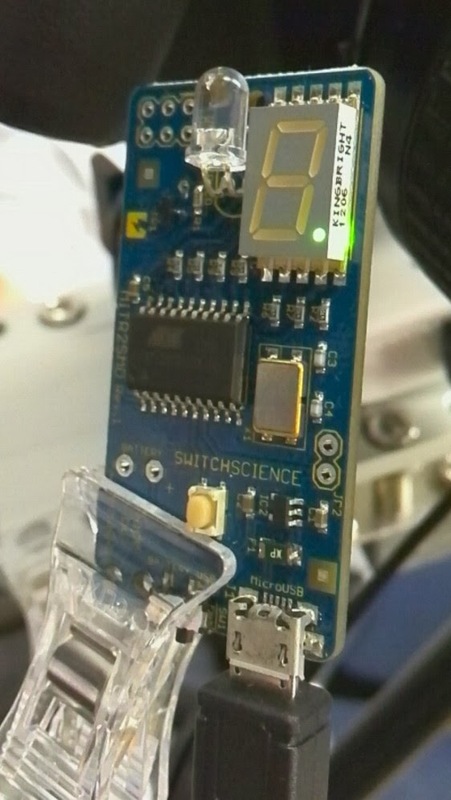 The guy in this booth is selling his device on switchscience. MIDI devices: there were several instruments that were using a VS10XX shield for Arduino to transform sensor data into MIDI data that could be transferred to a device such as the SD-20 in the picture. In particular, an implementation of a Cello with long touch sensors and pressure sensors was amazing. 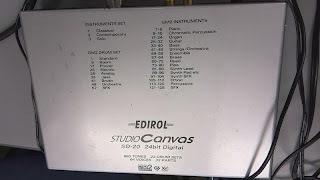 I also liked this instrument. 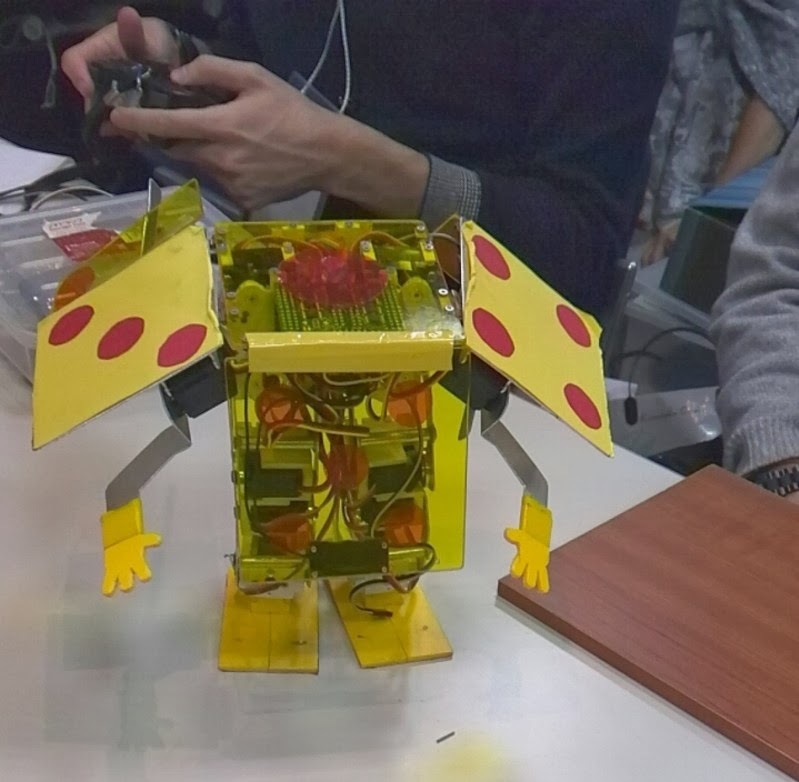 Underwater robot: there was a robot based on OpenRov which can dive into the sea. They were making connections waterproof by using these paste. 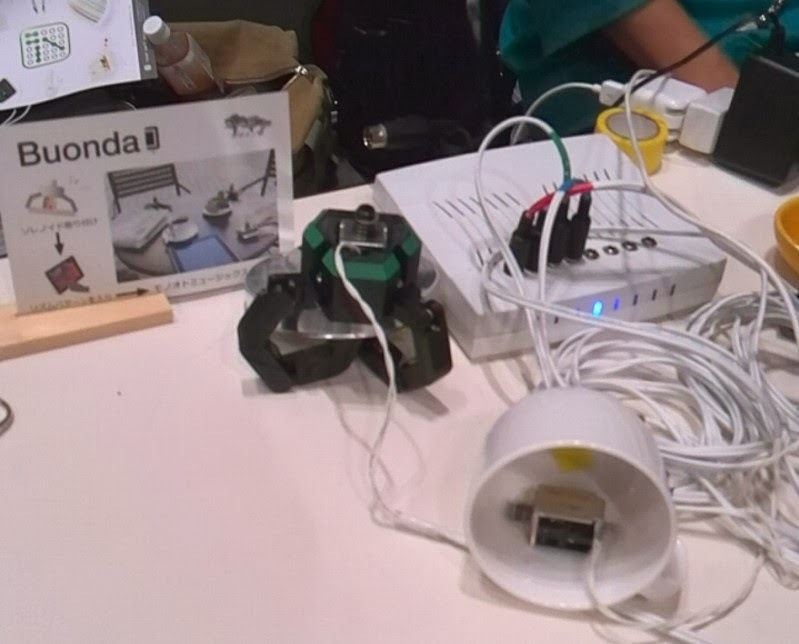 Perfect rice cooker: @lonely_somen uses a temperature sensor (a long rod) and a servo motor to make perfect rice. Check out his video channel. Exoskeleton: there was a regular performance of a few guys wearing this exoskeleton. The movement was very natural and looked stable. Dice robot: this robot was very interesting because of the fact that it can fold itself into a dice. 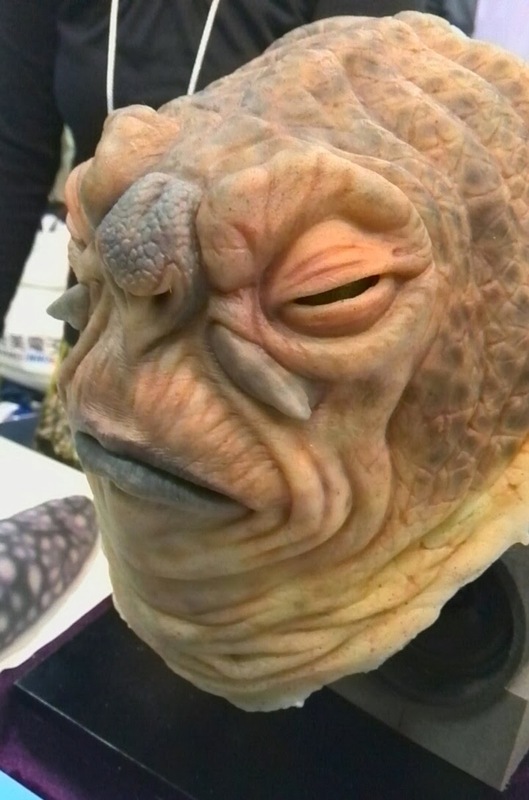 Animatronics: this Yoda mask had servo motors inside producing a very realistic movement. Check out his video channel. I believe he made his mask by creating a Fiberglass mold (model in clay and poor fiberglass plastic materials); then pouring liquid silicone; and finally applying paint through an airbrush. Laser pointer: this is a laser pointer inside a rubber. Drums on your sleepers: implemented through pressure sensors. He used Arduino with a bluetooth board to capture the sensors data and transmit it to a host PC. 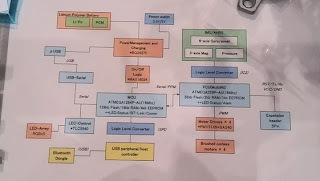 The host PC (a MAC) contained a small Python script to receive the data and forward it to an application called SampleTank through an operating system bus like Linux DBus. Arduino NTSC/VGA out: this guy was a veteran expert on creating NTSC and VGA output signals for Arduino. He was using this code for the VGA output. Check his youtube channel too. 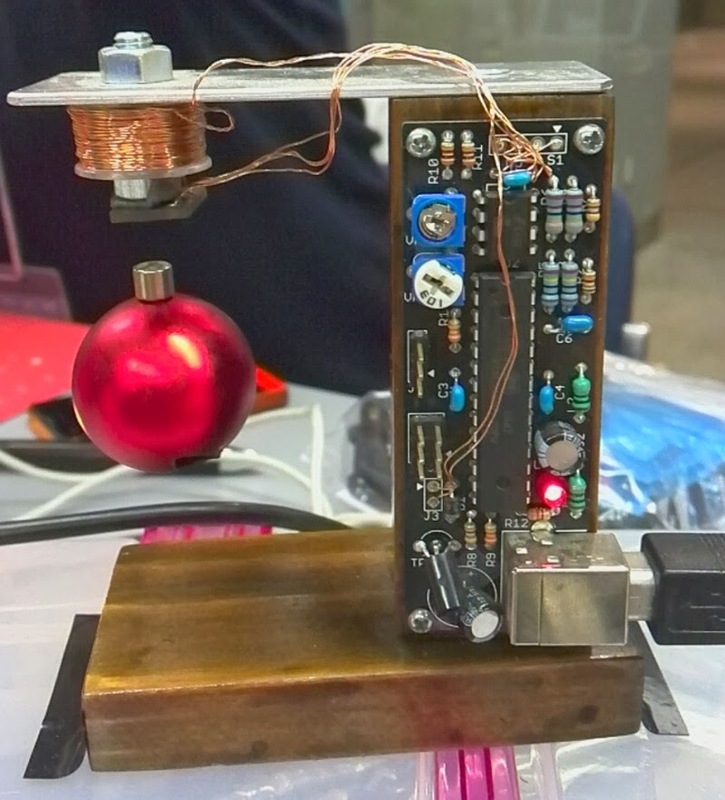 Self-made oscilloscope: this guy made his own Oscilloscope. He wrote an article about it in Toragi. He was also using very cheap displays from 秋月電子. 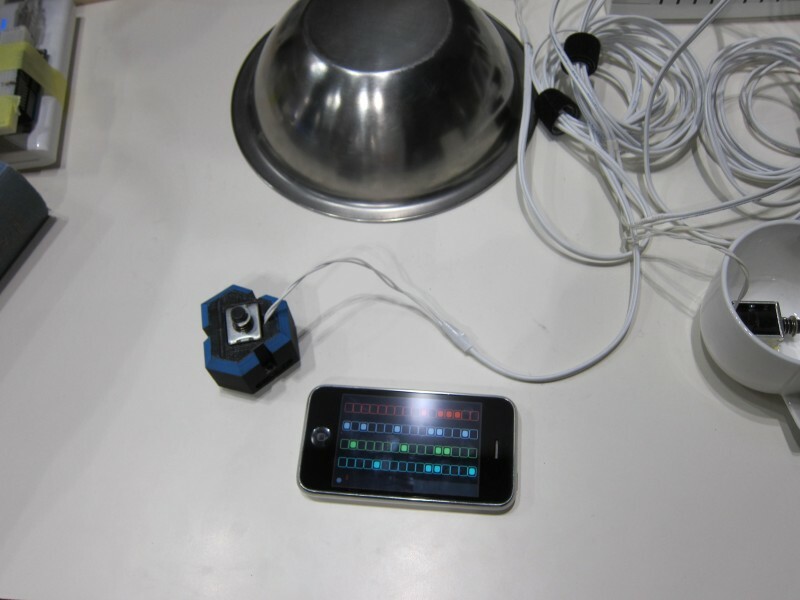 Instrument with arduino: @ina_ani made an interesting instrument with Arduino. Paper robots: this guy was making robots with paper. Gun follower: this guy created a gun that can track targets in blue. Leap motion: a guy used a controller called "leap motion" to move servo motors. 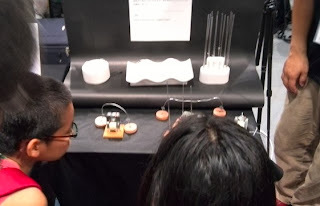 Nixie tubes and relays: there were many booths with nixie tubes (ニキシー管 in Japanese) and relays. It seems they are become very popular. A nixie tube contains Neon gas (and a bit of Argon and Mercury) and produces light through the glow discharge phenomena. Controlling a nixie tube requires applying 170 volts DC (obtained through a transformer) at a few milliamperes.